click, 3 hosted power counters: Add a card that matches the faction of your identity from your heap to your grip. If damage is the first time in a turn that a program or hardware is put into the heap, does District 99 gain a power counter? Yes. Damage causes cards to be trashed. 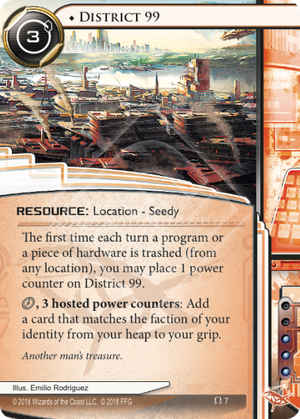 If discarding at the end of the Runner's turn is the first time that turn a program or hardware is put into the heap, does District 99 gain a power counter? No. Discarding is not trashing.